The gene pool[note 1] of a kind or population is the full set of alleles which can be found in the genetic material of each of living individuals of that kind or population. Other similar definition states that gene pool is the totally of the genes of a given sexual population. The gene pool for the A locus consists of all alleles for that locus in the population. The gene frequency of allele A1 is the proportion of all alleles in the gene pool that are A1. A large gene pool indicates higher genetic diversity, which is associated with the ability of populations to survive episodes of intense selection. On the other hand, a lower genetic diversity can result in an increased likelihood of extinction before intense episodes of selection. Purebreds or pure breeds, are cultivated varieties of an animal species, achieved through the process of selective breeding. If the lineage of a purebred animal is recorded, then that animal is said to be pedigreed. 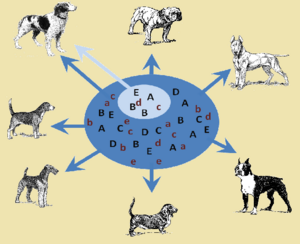 Because pure-breeding creates a limited gene pool, purebred animal breeds are also susceptible to a wide range of congenital health problems. Breeding from too small a gene pool, especially direct inbreeding, can lead to the passing on of undesirable characteristics or even a collapse of a breed population due to inbreeding depression. After the flood, when several languages came into existence, the groups who spoke the same language moved away from the other groups. Thus, the gene pool of a specific group shrunk dramatically as this group has not changed genes with other human populations and remained in relative isolation. A closer inbreeding occurred, and the characteristics of time were emphasized in these different groups. Adam and Eve possessed the genes to produce black, brown, and white offspring (and everything else in between), since God obviously desired humanity to be diverse in appearance. Speciation within the created kinds can be explained by genetic drift reducing the gene pool. Speciation occurs not by the increase in population diversity, but in the loss of heterozygosity in isolated populations. In cases where speciation may have been observed, the gene pool was reduced and it was not observed the emergence of new alleles. An example of this was observable in the London Underground mosquito where occurred a substantially reduced heterozygosity in the underground populations of the Culex pipiens. Evolutionists, with its flexible definition of evolution, cite this example as evidence of evolution. But to see variations in the gene pool, specifically loss of heterozygosity is not sufficient or serves to explain the evolution of inanimate matter to the existing species forming a common ancestry. In fact creationists do not doubt the "change in gene frequency with time" or "descent with modification", but what creationists do not see in these examples is not even one case of information-increasing. ↑ According to Ernst Mayr, the phrase “gene pool” for the genes found in a population is somewhat misleading. The genes are not swimming in a “pool”, but are linearly arranged on chromosomes. In: Mayr, Ernst (2001). What Evolution is. New York: Basic Books. pp. 105-106. ISBN 0-465-04425-5. According to atheist Richard Dawkins, The metaphor on which the term is based is a happy one as he says in his book 'the extended phenotype', for it de-emphasizes the undenied fact that genes actually go about in discrete bodies, and emphasizes the idea of genes flowing about the world like a liquid. In: Dawkins, Richard (1982). The Extended Phenotype. Oxford: Oxford University Press. p. 287. ISBN 0-19-286088-7. ↑ Meyer, Stephen C.; Nelson, Paul A.; Moneymaker, Jonathan; Minnich, Scott; Seelke, Ralph (2009). Explore Evolution: The Arguments For and Against Neo-Darwinism. Malvern, Victoria: Hill House Publishers. p. 146. ISBN 978-0-947352-41-6. ↑ Strachan, Tom; Read, Andrew P (2011). Human Molecular Genetics (4th ed. ed.). New York: Garland Science. p. 84. ISBN 978-0-8153-4149-9. ↑ 4.0 4.1 "What is the origin of the different races?". http://www.gotquestions.org/different-races.html. Retrieved 05-26-2012. ↑ "Adam + Eve = All skin tones?". http://www.answersingenesis.org/get-answers/features/adam-eve-skin-tones-one-race. Retrieved 05-26-2012. ↑ Byrne K, Nichols RA (January 1999). "Culex pipiens in London Underground tunnels: differentiation between surface and subterranean populations". Heredity 82 (1): 7–15. PMID 10200079. http://www.ncbi.nlm.nih.gov/pubmed/10200079. This page was last modified on 29 July 2014, at 15:59.